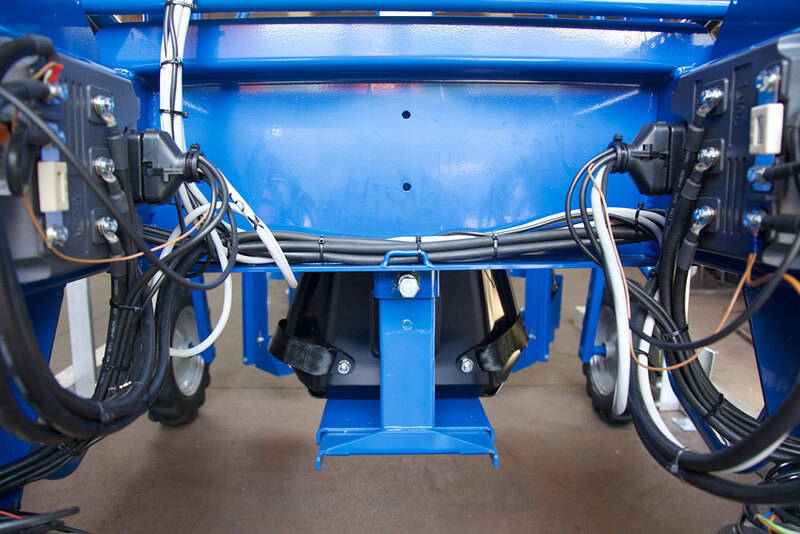 VALENTINA™ is an electric-drive agricultural machine. The machine makes it possible to pick, sitting comfortably, fruit and vegetables which cannot be collected mechanically because they are too soft. This machine, using the central collection setting, is ideal to pick asparagus, zucchini, salad, strawberries and weeds. Elastic, strong and lightweight frame made of high-resistance piping and plates; this is the same material used for high-performance motorcycle frames with a central height suitable to go over convex ground or tall plants. Vegetable harvesting both from the middle and the sides thanks to the shape of the frame. Surface protection with powder painting following an anti-corrosion cataphoresis treatment, also used for top-of-the-range car bodies. Seat continously adjustable height, recicling and forward movement. Rear transmission from two independent wheels powered by two three-phase asynchronous gear motors and electric brake for use without power, 1200 Watt each, obviously without brushes (no need for brush replacement or for armature reconditioning). Motors operated by electronic inverter power (built by a leading company worldwide, reliable and which have been used for years on cars and electric vehicles in Italy and abroad); they guarantee a variable speed between 0 and 15 Km/hour (or 0 and 7 Nm/hour in reduced speed), with continuous, progressive and proportional adjustment. Accumulator four 6 Volt 260 Ampere lead batteries connected in series. Running time 50 km or 10-12 continuous hours with new batteries and maximum recharge time of ten hours, through a battery charger delivering 25 Ampere with single phase operation at 220 Volt. automatic static braking when the machine is on with wheels in standby or completely off with or without an operator on board, either on level ground or on slopes up to 15%. The conformity with the Machine Directive 2006/42/EC actually ensures the employer and staff. Agricultural machinery which is not compliant shall not be marketed, and machines built before Directive 2006/42/EC amending Directive 95/16/CE of 1995 entered into force are not be used before they are brought up to standard, to avoid heavy and expensive fines in the event of inspections by the authorities in charge. If the mandatory safety measures are not implemented, in the event of an injury, the employer is primarily responsible for what happened. In these cases, any similar machinery still in use is left on standby until it has been brought up to standard. All machinery purchased after the Directives (1995 and 2006) entered into force, and which is not compliant with the latter due to the manufacturer’s fault, shall be brought up to standard at the expense of the said manufacturer. Adjustable track width with rear wheel base from a minimum of 1300 mm up to 1700 mm. Ideal to pick salad, strawberries and tomatoes. Electro-mechanical power steering, operated by one foot alone, to eliminate any steering effort. Access to the seat from the side of the machine. Each driving wheel is assembled directly on the outlet shaft of its own gear motor. Fixed track width with rear wheel base from a minimum of 1300 mm up to 1700 mm. Electro-mechanical power steering, operated by either the left or right foot alone, to eliminate any steering effort. Mechanical steering through pedals which require minimal effort from the foot thanks to the special shape of the front wheel forks and of the control leverages on the steering system. Access to the seat with central front entrance because the frame is bridge shaped. Fixed track width with rear wheel base of 1300 mm or 1500 mm. Fixed width track with rear wheel base of 1300 or 1500 mm. Ideal to pick asparagus, zucchini, salad, strawberries. Access to the seat with central front entrance because the frame is bridge-shaped. Each driving wheel is operated by chain transmission from the gear motor with a 1:1.75 ratio and constantly provides a torque of 735 Nm.